Do you like to spend a day in the outdoors? Are you looking for a fun family activity you can partake in? Lake Okeechobee can fulfill all your outdoor and fishing needs. Get away from the sandy beaches and salt air and enjoy a day on Lake Okeechobee. Explore one of Florida’s top bass fishing destinations on a Blue Bird Sky Fishing adventure of a lifetime! One of the best ways to experience this beautiful place is with one of our local experts. Years of knowledge and experience allows our guest to get on fish quick. Also, it allows for our local experts to educate you when you have questions about wildlife and species you may be catching. Our local experts know everything you will need to know when fishing on this beautiful lake. had to get out Lake Okeechobee Bass Fishing. It was an early start to the day but the fish were biting. Fishing conditions were calm and the wind was not blowing. Captain Miley wanted Dave and his sons to see different parts of Belle Glade, where they departed from. They caught fish at every spot they moved too. Grass mats were the main focus on this fishing trip. Live bait was the best method to catching over 20 Florida largemouth bass. They also caught bass on artificial baits including a soft plastic senko. The bass were holding around the structure. Mudfish also came out to play and were exciting as they are a hard-fighting fish and large in size. David and his sons will be back for more action in the near future! Captain Miley is looking forward to their next adventure. 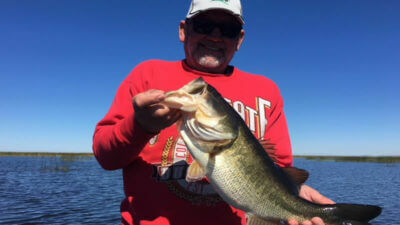 Just shortly after this fishing trip, Captain Robert Alfano explored what Lake Okeechobee had to offer. He adventured out of Okeechobee City, FL and had the pleasure of fish with Dan. Dan was traveling from Carlsbad, New Mexico. While doing so, bass fishing in Florida was a must. Many people travel from all over the world and have not a clue on how amazing fishing is here in Florida. The most productive method on this fishing trip was wild-caught live shiners. 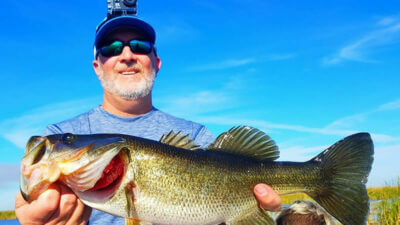 Dan caught 15 quality largemouth bass on his quick 4-hour fishing charter. The biggest bass of the trip was a beautiful 7.5 pound largemouth. When you explore Lake Okeechobee, you can’t ask for more! Dan will be back for more action in the near future! Captain Alfano is looking forward to their next adventure together!! retired firefighter who jumped out of airplanes. John was traveling from Southern Ohio looking to spend some time on vacation here in Florida. 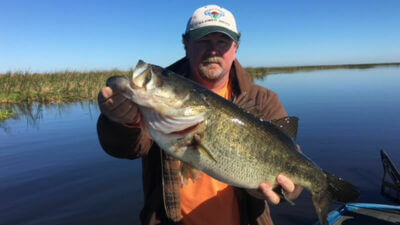 While doing so, these friends had to go out bass fishing on Lake Okeechobee. The weather conditions were nice and the skies were blue. Scenically, there is nothing like fishing under bluebird skies but that doesn’t always fire up the bass. The bass were not biting as strong as we would have liked but they managed to land some nice bass. Wild-caught live shiners were the most effective method to catching bass under mats. The biggest bass of the day weighed in at 6 pounds. Michael and John are looking forward to getting back on the water in the near future with Captain Dave!! Lake Okeechobee is starting to pick up! The bass are biting and now is a great time to come and have fun. There are a lot of great days of fishing ahead. Our local experts would love to show you around this beautiful place. Every time you explore, you will have a completely different experience. Bring your family along for a fishing adventure of a lifetime! Come Visit Florida and Catch Yours Today.. 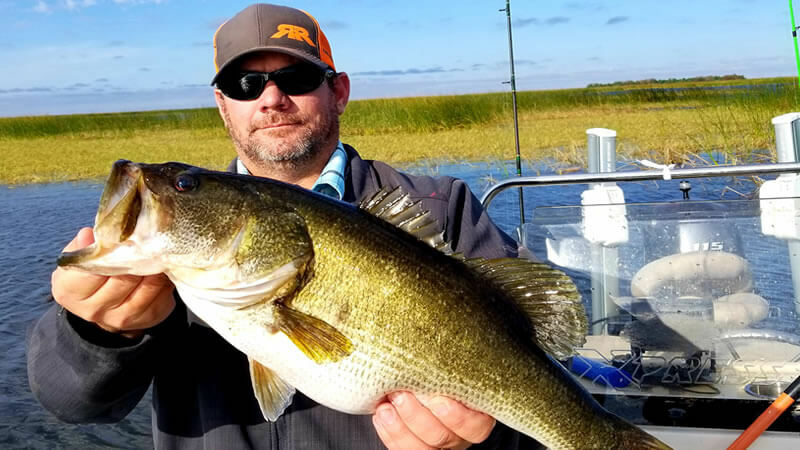 If you enjoyed this post about Okeechobee Fishing, you might also enjoy this fishing report from the same area.